The meme is a very controversial and debated concept. Many use it daily; many have something to say about it; but few people actually know what the word meme–a “meme” in itself–is actually about. Some background, in the form of an etymological exercise, is necessary. Language, which is a very important–if not the most important–part of culture, is a very biological phenomenon; it grows, mutates, changes, disseminates, replicates, responds to environmental stess, etc. So, it should not be surprising at all that a biologist had something to say about culture. While a geneticist talks about a gene in regards to the DNA molecule (as single unit of biological information), a modern anthropologist may refer to meme as the unit of cultural information. Basically, every word uttered is a meme of sorts. They are repeated, preserved, developed, discarded, trendy, etc. ; and in this process, languages are made. When trying to make sense of what ‘meme’ entails, its current use–which is not necessarily what Richard Dawkins intended–has to be put into the context of the web. Nowadays, ‘meme’ cannot be thought of without talking about grumpy cats, meme generators, etc. They are bits and pieces of cultural information that jump from Facebook wall to Facebook wall; from Twitter feed to Twitter feed; ideas that are funny and, more often than not, poignant. They are transmitted. And if there is a tool that best serves this quality (transmission), that tool is the internet. 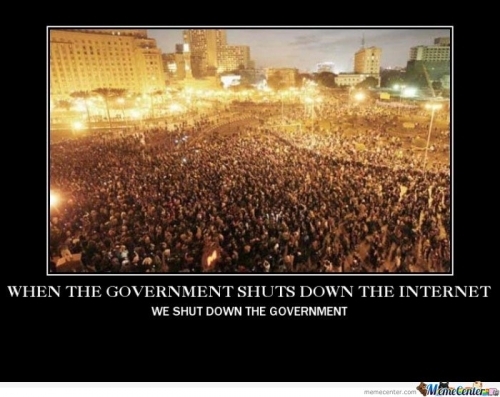 Internet censorship is still a hot button issue. Humor has always been a good vehicle used to address issues that affect our daily lives. They give us this “Ah, ha!” moment, what is known as catharsis, making us understand things in ways that conventional mediums (newspaper articles, TV news) fail to do. Memes are units of cultural information that spread; and in the internet age, they mutate and spread with astonishing speed. They are a good way to have a pulse on current issues (politics, religion, art, science, etc.). Maybe the current meme is not what Dawkins reffered to, but it does spread in exponential numbers. And this is something worth checking out; we have to think about the web and how it affects the way we interact with each other and our surroundings–and to understand the significance of a meme is a good first step. I think that is very interesting, when I first heard of memes and I researched them I thought they were useless and silly things, after reading this article I am more open minded about memes. I have an idea, what if we were, in class, to make our own memes about whatever we are studying and so we could use them to study and to refer to certain subjects relating to science. I’ve already thought about that, Manuel! I’m still brainstorming about possible ideas. Your recommendations are very much appreciated. Memes–like graffitti–can be useful tools of expression. since this silly but humorous photos came out i always thought that a meme meant the picture or a sort of joke but by reading this it has really opened my mind to this. To know the origin of contemporaty issues such as these is always enlightening. WOW! I have seen memes before but I didn’t know where they came from. Now I do. Yay! 😀 Also I didn’t know what the word meme meant and it’s absolutely different of what I imagined. When we reach genetics, we can talk a bit more about memes. Both concepts are related: one refers to DNA (gene); the other one refers to linguistics (meme). i always believed memes were meant to make people laugh, now i understand that they can be both amusing and educational. Every form of expression–art, music, cinema, graffitti, memes, etc.–can be a source of enlightment. The important thing is to learn how to appreciate the value of things. That is why reading, anything, is so important. At first, when I read about memes and when i first saw them, I wasnt very interested but now after reading this article i’m very surprised what the word means. And i agree with raquel, I always thought memes were for entertainment but now i know they can also be educational. Popular culture can be very informative. 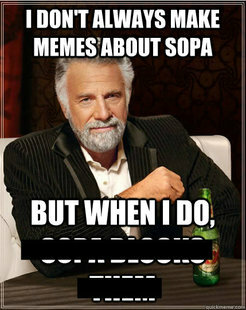 I don’t always post comments about memes but when I do I use memes to post about them. By the way I wanted to tell you that you should use the theme splendio instead its free and much simpler. Thanks for the suggestion, Alexander. Lol! Comments as memes. Creative. I have never heard about that word, and I really had to research about this theme. I could understand that this term refers to all the activity that are created in the internet . Its the greatest of the internet that can communicate something very fast like a virus, we can put images, thoughts, ideas, pictures, symbols, products, etc. They could be imitate, reproduce, maintain during all the time. “Virus” is a useful metaphor when it comes to memes–and language as well. memes always make me laugh so to now know some are for educational purpose i would love to read all kinds of memes people may post! btw i would’ve never imagine they were for educational purposes! Any piece of cultural information–book, film, comic book, tv show, etc.–can be educational in some way. The important thing about education is that it is not limited to what happens between he walls of a classroom. any event can present itself as an educational opportunuty. It would have never gone through my mind that memes were created for educational purposes. It has changed drastically through out the years because first it was for educatiional purposes and now days they are done for simply a joke or even it is used for bullying. Memes are like scissors: they can be used as a tool, to cut paper, make art, etc., but, unfortunately, they can also be used as a weapon, i. e. bullying. Any cultural object, be it from the present or the past, can give some insight into the human experience. I agree. Memes are visual tools with short, linguistic units. I’ve been contemplating the use of memes in class. Memes would work for almost anything. They are units of information, and information can be used in many different ways. So, yes; memes can say a lot about the human experience. I wasn’t aware that Richard Dawkins was the man who basically invented the word meme, although I had already researched that its origin was from latin, but the best information I got from this post was the name Neil deGrasse Tyson. I had previously watched a lot of videos from Carl Sagan (which is an amazing commentator) and now I know the name to someone who seems to be as equally entertaining and educative as him. Carl Sagan was a great humanist, educator and scientist. The world lost a great man in 1997. It’s nice to know an origin story; especially about something as contemporary as a meme. I feel that memes can be a very resourceful tool for the future and the internet. Although some people use it for wrong, think about all the good it can do in education, work, and everyday life. As a unit of cultural information, memes can be used to transmit all kinds of messages. Education might well be a new way of applying the power of memes . I believe that memes have great value, even when they are just meant as a joke. Many times, the best way to make a point is through an effective punch line. I agree. Memes are like graffiti: in the sense that people believe that they don’t have any sociological value, when in fact, both mediums—graffiti and memes—can give a lot of insight into what people are interested in. Memes are so fun, its another way to express and change the meaning of a picture. Look for the word «semiotics» in Google. Memes deal a lot with this concept. Before reading this post, I thought memes were all funny but I learned that they can also be educational sometimes. Memes can make learning more entertaining than it usually is. Memes are units of information that can have cultural value. With very little information—a few words, an image—they can say a lot. I now know that memes can not only be funny but educational too. I encourage you to do your own memes, educational memes that is. woooooooooooooow memes are not just funny pictures ?! funfact: memes can be used for almost anything. If we are to understand anything about contemporary Internet culture, memes cannot be ignored. Wow! I would have never thought that memes came from that! This article really opened up my mind about memes! Really intresting!